On 12th August The Times published a piece which caused concern in the birth world. Its central premise was that with immediate effect the Royal College of Midwives (RCM) would ‘no longer tell women that they should try to have babies without medical intervention’. The less sensational reality is that the RCM’s Normal Birth Campaign was discontinued three years ago in order to launch a wider Better Births Initiative, and in a review of the RCM website in May this year, references to the earlier campaign were removed, because they were out of date. The ‘story’ was replicated in the Independent, the Guardian/Observer, the Telegraph and the Sun newspapers, pointing to a worrying tendency to take old news and create new problems for healthcare professionals, because poorly researched articles are generally indistinguishable from robust investigative journalism to the lay reader. CEO Cathy Warwick yesterday reiterated that the primary purpose of the RCM “is and remains to support midwives to provide the highest quality maternity services to women and babies”. Doula UK supports midwives and their key role in supporting safe, physiological birth, and we share the view of our colleagues at Birthrights that no woman should be told how she should give birth. We agree that the term ‘normal’ when applied to childbirth is unhelpful. The RCM’s 2014 decision to replace the Normal Birth Campaign with the Better Births Initiative was therefore widely welcomed by birth workers from all disciplines. At a time when our NHS colleagues are working phenomenally hard against unsurmountable pressure, the Media must take responsibility for ensuring any commentary it offers is at the very least fact-checked. A more constructive news item might address the fact that while several consultations have highlighed the importance of continuity of care, it is not yet the norm for many women. The real story is that until this can be guaranteed (through proper resourcing), many who want to avoid unnecessary interventions during labour will still end up having them. Choice is key, and treating every woman with respect and compassion is of paramount importance, whatever their individual needs are. 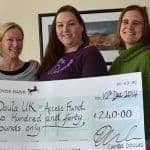 Doula UK supports all midwives in their goal to offer the best possible care to all women.